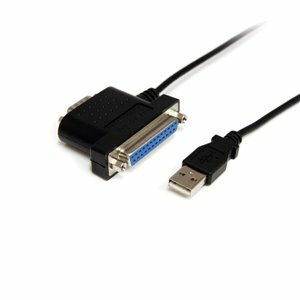 Add one RS232 Serial, and one IEEE 1284 Parallel port to your computer through a single USB connection. The ICUSB2321284 1S1P USB to Serial/Parallel Adapter Cable enables you to connect DB9 RS232 serial devices and IEEE 1284 parallel devices to your PC or Linux laptop or desktop computer, through a single USB port, as though the computer offered onboard connectors.An innovative solution, the adapter cable features both a parallel and serial port that can be used simultaneously, delivering serial and parallel data rates of up to 921.6 Kbps and 1Mbps (respectively) to ensure optimum performance from your connected devices.Simple to install and use, the serial/parallel USB adapter is a cost-effective solution that bridges the connectivity gap between modern computers and legacy serial peripherals. The ICUSB2321284 1S1P USB to Serial/Parallel Adapter Cable is backed by a StarTech.com 3-year warranty and free lifetime technical support.